Need a florist to send gorgeous flowers from NZ to Sydney, Australia? Pure Flowers is here to help! We deliver gorgeous blooms from our award-winning florist anywhere in Sydney. Need to send flowers to Sydney frm NZ? Pure Flowers is here to help you order lovely flowers from Auckland, Wellington or anywhere in New Zealand. 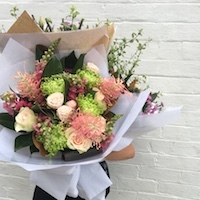 We hand-select our favourite fresh blooms from Sydney Flower Market and use them to create stunning hand-tied bouquets, rose bunches and wildflower designs. Whatever the occasion, our florist delivers gorgeous fresh flowers from our award-winning flower shop to anywhere in Sydney. Place your order by 11am weekdays and 9am Saturdays, Sydney time, for same day delivery. Ordering is easy – buy online or call + 612 9427 8214. Read our flower care tips so that flowers can be enjoyed for longer in the home. Do you like DYI projects? Enjoy our guide to creating the best party flowers for any occasion.